Like minimalism or modernism, familiarism is an approach to how things are designed. This page serves as a working explanation of the philosophy of familiarism. I did not create this design practice, only recognized its existence with a name. This page serves as a formalized idea of what I see as the definition of familiarism in design. If anyone feels that this idea has already been coined, please reach out. Familiarism is the design philosophy of adding a familiar or subconscious interaction to an incongruous object in the effort to create an easier or more unique experience. When I was studying at the Savannah College of Art and Design in 2012, one of our first studio projects was to design a night light inspired by a well known designer. Our professor, Owen Foster, provided us with a list of star designers (Dieter Rams, Luigi Colani, etc.). As young design students just starting out, none of us knew any of these, except for Dieter Rams of course. Rams was the first to get selected, and so I was left with a few of my other choices. My professor had suggested Naoto Fukasawa as he thought I would find his simple designs attractive as well. This project eventually became my Prism nightlight. The project was strictly focused on understanding and implementing the philosophy of the designer and not just mimicking their products. I studied Fukasawa’s work intensely and found a playfulness and subconscious understanding in his designs. Fukasawa discusses his CD player he designed for Muji. The rounded square is mounted to the wall with the power cord draping down to the outlet. Fukasawa was inspired by the way a ceiling fan has a dangling cord. When pulled, the fan slowly starts to spin and the user feels a nice breeze. Just the like fan, when the cord on the CD player is pulled, the CD slowly starts to spin and the user feels the music. Fukasawa’s design philosophy is well documented elsewhere, and I urge you to go research this amazing designer. I found a lot of his designs have these subtle subconscious cues and playful elements, and realized these subconscious cues exist as familiar interactions. At the time, possibly because I was in the “bubble” of design school, minimalism was a prominent trend. From a thousand foot view, one might see Fukasawa’s designs as minimal. But upon further examination, I found that these familiar interactions brought life that minimalism seemed to lack. Adding a familiar element to a rather stark or simplified object elevated the experience to enjoyable instead of utilitarian. On the design trend pendulum of minimalism to baroque, I see familiarism as a retreat from minimalism just enough to be delightful. After searching for more documentation on these familiar interactions used in design and coming back empty handed, I decided to name it familiarism. I started to save any objects or designs that I felt might possess this philosophy on my Behance Collection Page. This collection is by no means an absolute representation of familiarism, merely familiar elements implemented into design somehow. Some are better examples than others. Familiarism can often be seen as clever design, but not all clever design is familiar. Some clever designs are only clever when the user discovers the “secret” or finds the hidden meaning. Familiarism, in contrary, should be obvious and invite the user to interact with the known element on the unknown object. I’ve also found that familiarism can be misconstrued as kitsch design. For example, a santa claus cookie jar has a familiar character/form added to a container. Yes, the familiar character creates an enjoyable experience. However, this is not familiarism. Familiarism is, as previously stated, a slight departure from minimalism. It is reserved and considered as much as any good minimalist design. Further, I find that familiarism is strongest when it refers to interactions as opposed to form or icons. A great example of familiarism I found a few years ago, is the Plugg radio by Skrekkøgle. 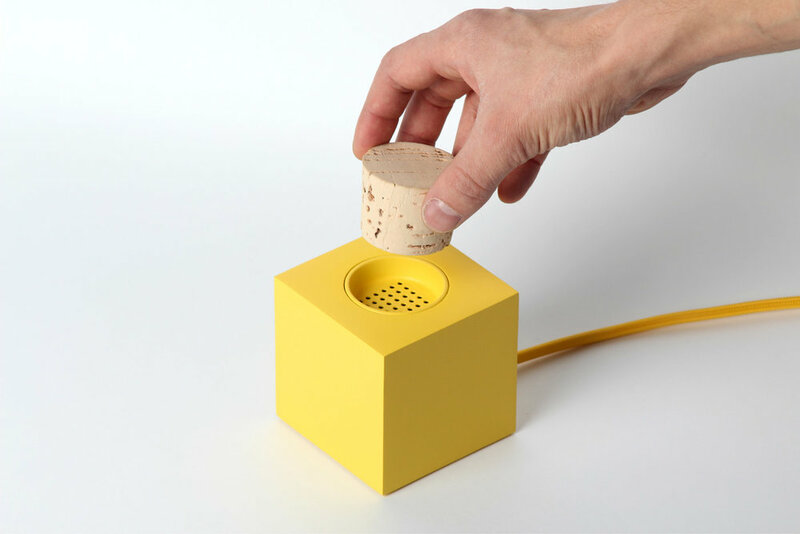 A simple cube radio with a cork placed on the top over the speaker. When the cork is removed the radio turns on and flows through the hole. This familiar interaction of removing a cork and pouring out a liquid relates directly to the flow of audio. The implementation of this familiar interaction creates an entirely new and unique experience, elevating and pushing the idea of a simple radio. Another related idea, that I find has a similar design goal, is skeuomorphism. Skeuomorphism is an existing design practice of mimicking real world objects in 2D graphic applications. The most popular instance I can recall is Apple’s original iOS on the first iPhone. For example the notes app looked just like a legal pad, or the calculator had photo-real buttons similar to the ones you would find on the Braun ET44 calculator. The idea behind skeuomorphism was to help users who had never interacted with the new interface adjust to the uses of each app. One might not know what the notes app did if it were a simple white word processor with a blinking cursor. The implementation of familiar elements on a 2D screen helped create an easier and more delightful experience for the user. Today, now that we are all familiar with our smartphones, there is no need for realistic looking icons and apps. Thus skeuomorphism has fallen out of trend to a more flat simplified design. Skeuomorphism, while similar, is not familiarism. Familiarism refers to the design of physical objects and interactions. While I’ve coined familiarism and have implemented the thinking in several of my designs, I find that it is by no means the ultimate or absolute design philosophy. Each and every product should be designed with care according to the circumstances in which it resides. I will continue to refine and define this finding as my career progresses.